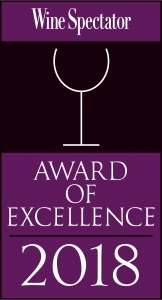 Wine Spectator Magazine honors Montecatini Ristorante “for having one of the most outstanding restaurant wine lists in the world.” We are delighted and humbled for receiving this Award of Excellence from Wine Spectator, being in the company of some of the finest restaurants around the world. https://restaurants.winespectator.com/…/montecatini-ristora… or August 31, 2017 and 2018 Issues. Our philosophy at Montecatini is to provide authentic Italian cuisine, amazing service, and superb wines and cocktails that would bring joy to everyone, whether for a family on a budget or a foodie on a first date. Our wine list highlights Italian and Californian wines, being an Italian restaurant that is located within 2-hour driving distance of the world famous Napa and Sonoma Valleys. We carry Orin Swift’s Machete on our wine list long before it was name #6 on Wine Spectator’s list of 2016 Top 100 wines in the world. Along with our wine list, we also feature a wine-by-the-glass list with about 25 wines, of which nearly 15 wines are available at Happy Hour prices from 5:00 to 6:30 pm every day. We change our wine-by-the-glass list regularly but always have several delightful Italian wines starting at $5-7. We want to make expensive wines accessible and comfortable for our guests. For example, we have Frank Family Zinfandel for $10 and Far Niente Chardonnay for $15 at Happy Hour prices. Whether our customers want to be modest or spurge for a special evening, we have wines to meet everyone’s wishes, and our wait staff treats everyone like royalty regardless of the wines they ordered.